Dr. Erin E. Carlson is an Associate Professor in the Department of Chemistry at the University of Minnesota. Erin received her B.A. in chemistry from St. Olaf College and her PhD in organic chemistry from the University of Wisconsin, Madison. Subsequently, Erin was awarded an American Cancer Society Postdoctoral Fellowship to conduct research at The Scripps Research Institute. She served on the faculty at Indiana University before joining the faculty at the University of Minnesota where she is today. Among her many awards and honors, Erin is a recipient of the Presidential Early Career Award for Scientists and Engineers (PECASE), a Pew Biomedical Scholarship, the NIH Director’s New Innovator Award, the Indiana University Outstanding Junior Faculty Award, an NSF CAREER Award, and the Cottrell Scholar Award. 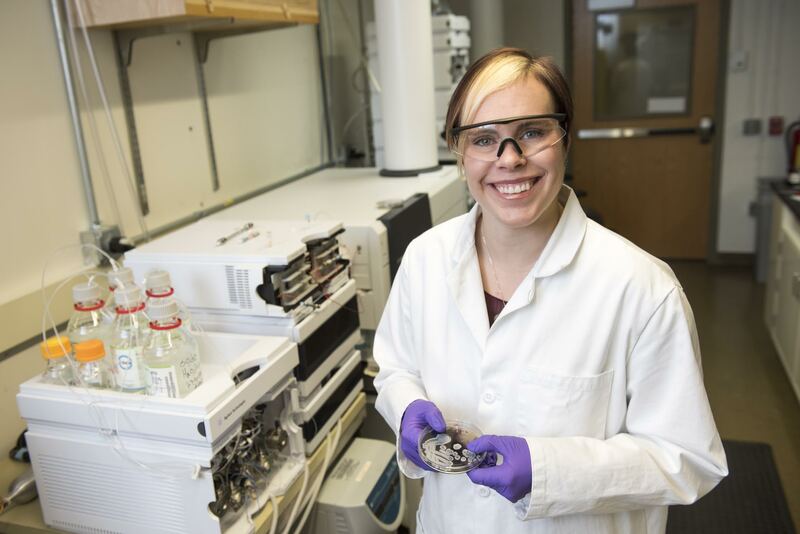 In addition, she was named a Sloan Research Fellow, an Indiana University Dean’s Fellow, and an American Chemical Society Women Chemists Committee Rising Star. Erin is with us today to tell us about her experiences in life and science. Travel is a passion for Erin, and as a scientist, she has had many wonderful travel opportunities. She particularly enjoyed going on a safari in Tanzania, as well as traveling to Indonesia and South America to present her research. In addition, Erin is an avid photographer who documents all the places she has been in the world through her photos. Research in Erin’s lab focuses on microbes. They are interested in how these organisms interact with one another, humans, and the environment. Over the course of modern medicine, we’ve come to appreciate that microbes make a lot of potentially important therapeutic agents. In particular, Erin’s group is studying how microbes may be able to continue to provide us with antibacterial agents despite issues with increasing antibiotic resistance. Since her father is also a chemist, Erin spent a lot of time in his laboratory during her childhood. She was able to see firsthand how chemists could work to solve really important problems, and her father has continued to be an important mentor throughout her career. Though her interest in pursuing science dates back to early childhood, her interest in infectious diseases was sparked during a trip to Peru in high school. In college, Erin was able to work in the lab with a few different faculty members, and she loved it. During her PhD thesis work, Erin developed some promising molecules to inhibit bacteria, and testing them in a few different assays seemed to work well. However, about three months before she was scheduled to defend her thesis, Erin realized that some of the actions of these molecules were due to the fact that they were degrading in the assays. She was already preparing to move to California to begin her postdoctoral position, but it seemed like everything was beginning to unravel. Erin suddenly faced the challenge of how to show that these molecules were useful and that her hard work hadn’t been wasted. She was able to write a paper outlining the nature of the degradation and the useful components of the structure that could be used for design of future molecules. Erin was recently awarded the Presidential Early Career Award for Scientists and Engineers, and she was so proud of all the people in her research group who contributed to the work that led to this award. As one of the award recipients, Erin was able to visit the White House with the other awardees, listen to an address from President Obama, and shake the President’s hand. This was one of the biggest moments in her career so far. One of the most memorable places Erin has visited is Panama. She traveled there as part of the Pew Biomedical Scholars Program and was amazed by the country. Erin spent a week before the meeting exploring the country, learning about the Panama Canal, and touring coffee farms there. The meeting was a phenomenal scientific experience as well, and Erin was exposed to new ideas from this brilliant and diverse group of researchers. In graduate school, Erin discovered that baking is an activity that really helps her relax. She started baking different things at home and bringing them to the lab to share with the group. When she started her own lab, this habit continued, and now it has become a tradition for her to bake a cake whenever they have a success to celebrate. Even though she likes to bake, Erin doesn’t consider herself a particularly exceptional baker. She finds it fun to try out new recipes, experimenting with alternative ingredients when she’s missing something, and seeing how things turn out. Engage as many people as possible. You don’t have to know all the answers, and it is really helpful to talk to as many people as possible about things you don’t know well. Also, ask the big questions and figure out the details of how to get there later. It’s easier to be motivated and excited when you know you are pursuing an important question. Erin started her independent career at Indiana University in 2008, and she moved her research group to the University of Minnesota in the summer of 2014. To meet the challenges of antibiotic resistance and specter of a post-antibiotic era, a goal of Erin’s lab is to discover the master regulators of bacterial growth and communication and ultimately, the identification of new antibiotics through the application of diverse tools at the interface of chemistry and biology. They are currently pursuing multiple intersecting objectives: 1) Development and application of powerful strategies to explore and interpret the molecular language used by bacteria to respond to environmental cues using a combination of mass spectrometry, informatics and novel separation reagents, 2) Pursuit of the generation of chemical probes and inhibitors for the global profiling and inhibition of histidine kinases, a ubiquitous class of proteins essential for signal transduction in bacteria, 3) To deepen our understanding of the multi-protein systems that dictate bacterial growth and division, they are designing selective probes for imaging and proteomics with specific focus on the penicillin-binding proteins, and 4) Explore the molecular-level interactions between organisms and nanoparticles to guide the development of environmentally benign nanotechnology. Each of the lab’s research objectives is independently important for potential therapeutic development, but Erin’s research is unique in its focus on the synergy between multiple areas that will allow them to detect, interrupt, and exploit the master regulators of bacterial behavior.